The government in the Australian state of Victoria has granted approval for the Golden Plains Wind Farm. If the federal government agrees, this will be Australia's largest wind farm after completion. The plans sounded gigantic: The largest wind farm in the southern hemisphere with a capacity of 800 to 1000 MW was to be built in the Golden Plains district in the Australian state of Victoria. Onshore, mind you. In Europe, wind farms of this size are only known offshore. However, as more and more voices were raised warning of the environmental impact of a wind farm of this size, the planning was somewhat reduced. But the dimensions still remain huge: In four years, between 181 and 228 wind turbines are to generate electricity. The wind farm will be located in an area of 170 square kilometres near the small town of Rokewood to the west of state capital Melbourne. The investments amount to 1.5 billion dollars. The Victoria government has now approved the project, but as Australian media report, the federal government has yet to give its approval. According to Renew Economy, Victoria’s energy minister and acting minister for planning Lily D’Ambrosio is convinced of the planned wind farm, which would generate almost 3,000 gigawatt hours of electricity per year: "This project will create hundreds of local jobs, reduce greenhouse emissions and generate enough electricity to power more than 400,000 homes — boosting supply and putting downward pressure on power prices." The exact size of the wind farm will also depend on the environmental requirements imposed on the project developer WestWind, originally from Germany. The acutely endangered Brolga nests in the region mostly consisting of arable land. Enlarging the turbine-free buffer area around the wind farm should ensure that the wetlands used by native birds are adequately protected. This would involve reducing the size of the farm by up to 20 percent, according to The Sydney Morning Herald. 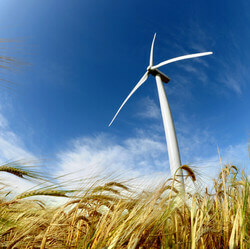 However, the impact of the wind farm on the environment remains significant. Golden Plains Shire mayor Owen Sharkey told The Courier that he was not sure if local people could really imagine the scale of the project when dozens of turbines up to 230 meters of height will be installed on 17,000 hectares of land. To mitigate the impact on the inhabitants, not only landowners will be remunerated, but local residents will receive money, too, and free electricity. A fund for the community will also be set up. "It'll be quite interesting to see what Rokewood looks like (when construction is finished)," says Sharkey, who is critical of the impact on the small rural town. Victoria's government has set itself a target of 50 percent renewable energy by 2030. The Golden Plains wind farm will be critical to fulfilling this commitment. No wonder, then, that the state government has now given the green light. A decision of the Federal Government is expected in the course of the coming month. Australia has become a trend market when it comes to renewables. In recent years, the country has invested massively in expanding grids and in generating and storing energy with renewables. This could enable the country to reach the Paris Climate Agreement targets even ahead of time. The development of Australia’s first offshore wind farm has been stalled by Energy Minister Angus Taylor’s failure to sign off on an exploration license allowing a detailed assessment of the wind resource to commence.